Once there were 14, now (after today) there are 8 left in the chair queue. 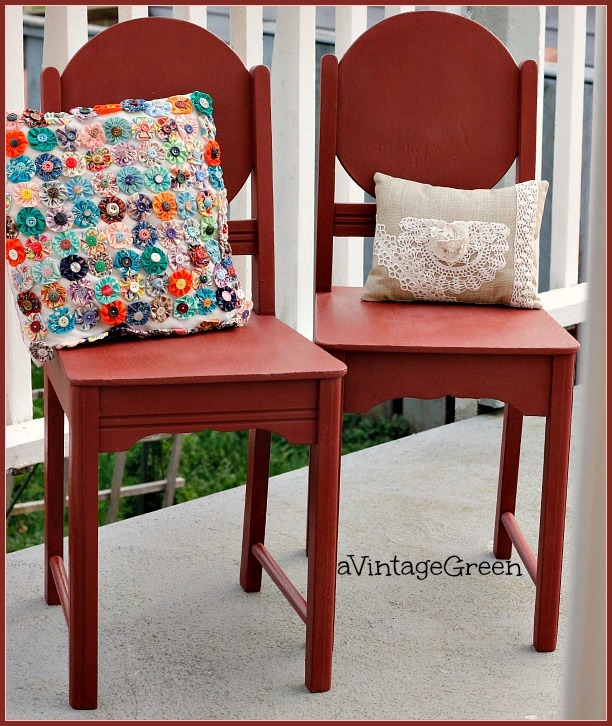 Two thrifted barn red vintage chairs that need a bit of TLC, some gluing/clamping and a wipe down. 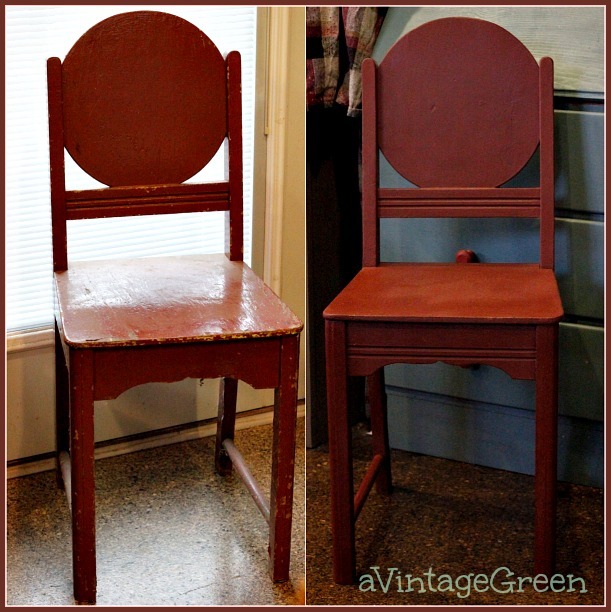 started the first coat of ASCP Primer Red, almost the exact same shade currently on the chairs. Dried in the sunshine. Debated - clear wax or MinWax Polycrylic. Chose ASCP Clear Soft Wax, polished. Something pretty on the walk to school when picking up DGS. Neighbours (grandparents) decorated their yard, I think for the pleasure they give to the families who walk by. Next post is April 14th at 7:00 a.m.
What a transformation! I love the yoyo pillow too! I had a sweet lady at the nursing home who made quilts and pillows for her family. It was a great way to pass the time. 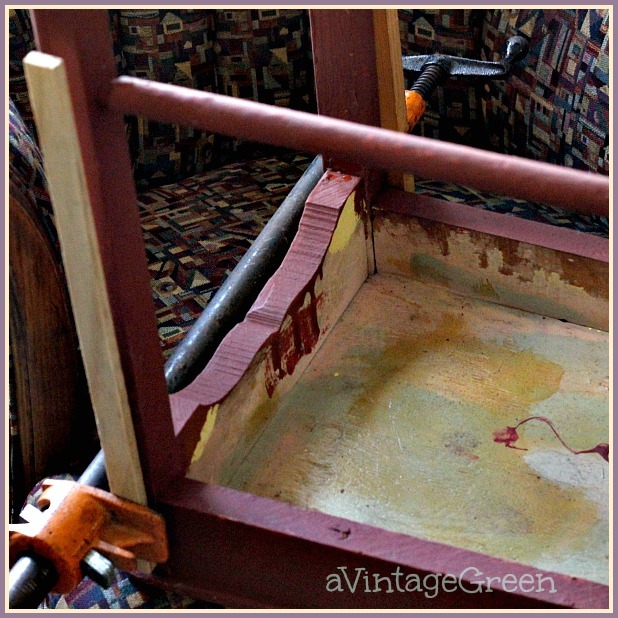 She is still living at 99 years old, but no longer sews. She did when I was there at 96. Hi Joy!! Hope Spring has arrived at your home. 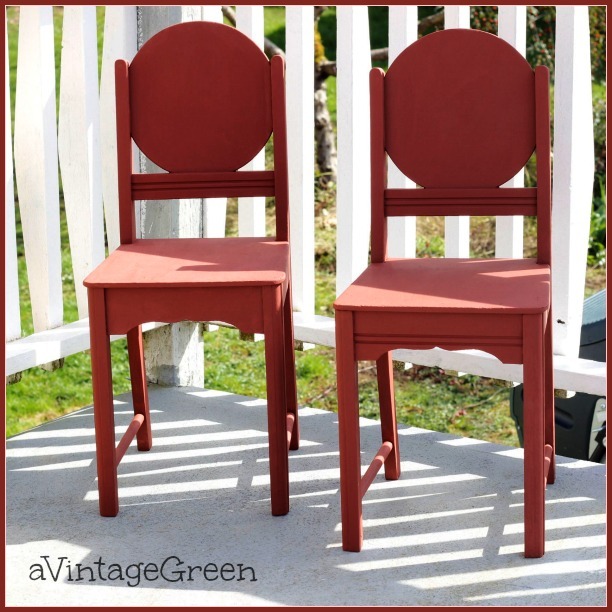 Love the red chairs!! That red is really a neutral red color. Love it. What a great red! Not too red, just right! Love the round back on them too. And the sweet pillows! Hi Joy, coming to you from the Junkin Joe Party. 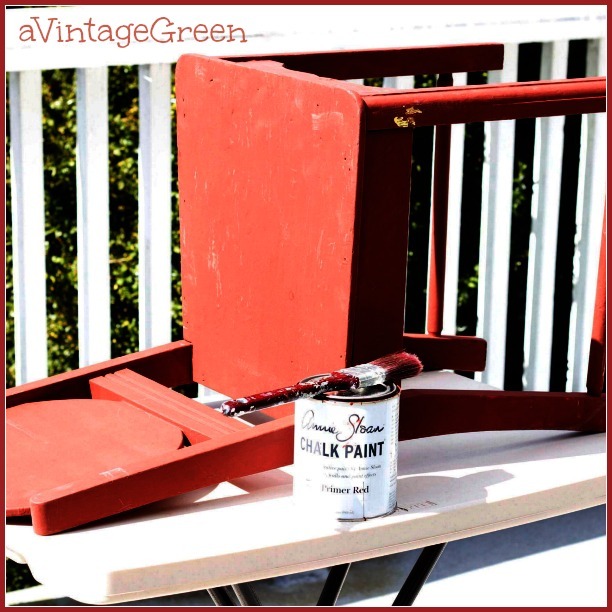 I haven't tried ASCP Primer Red yet but your chairs have inspired me to give it a whirl perhaps on a garden bench this summer. I'm glad you decided to go with the clear wax rather than the poly. The clear wax has such a beautiful satin finish. 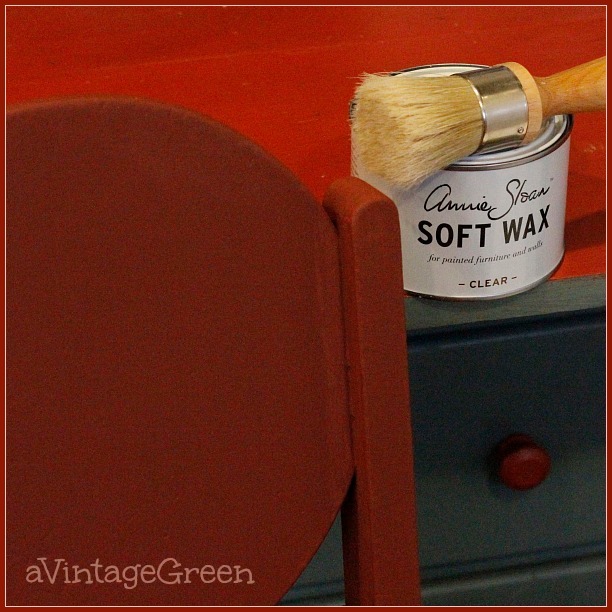 Have you tried dark wax with primer red? I suspect it might add a lot of depth to the color. 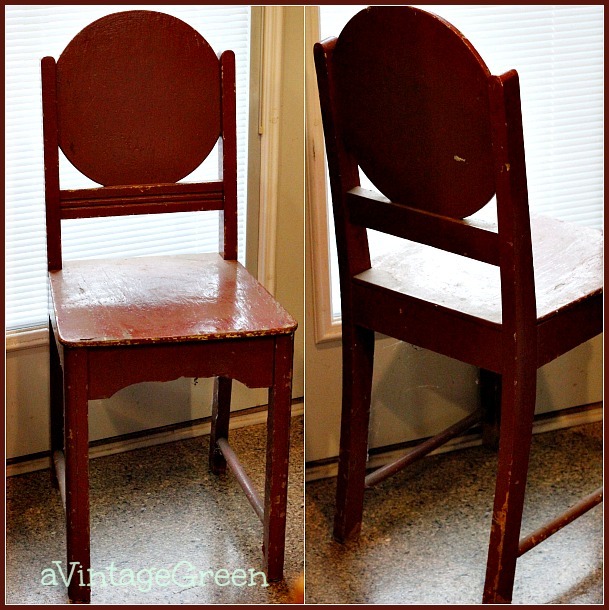 Love the lines of your chairs too! I love the design of those chairs. So simple, yet classic. I love that your paint job restored them instead of transforming them. Beautiful! Also, is that green grass in that other pic? Has spring come to BC? I always use Emperor's Silk red, but I like Primer Red. Now, what needs painting so I can give it a try? 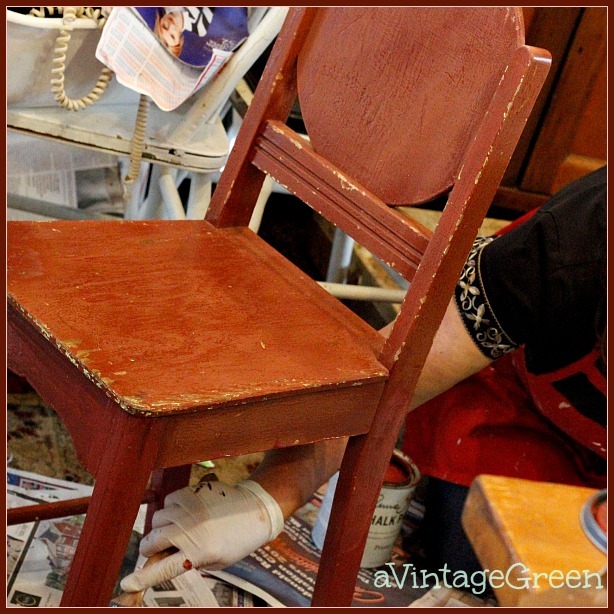 A great restoration project! The chairs look fantastic! The white bike startled me at first. 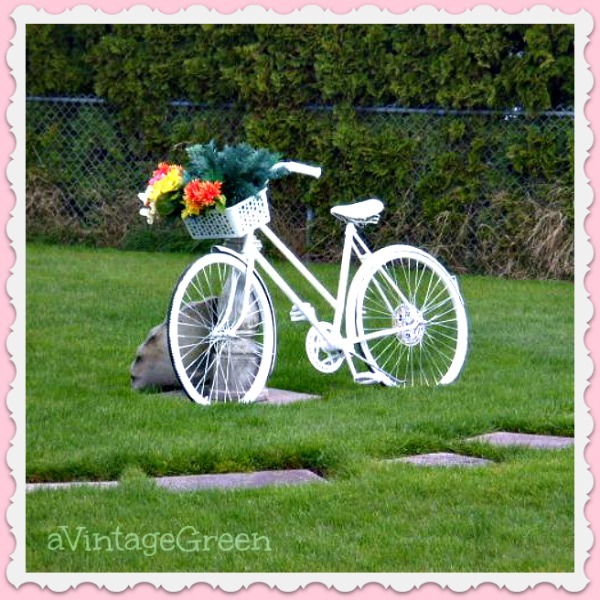 Here in Ontario, white bikes are placed at the scene of an accident where a bicyclist has been killed. 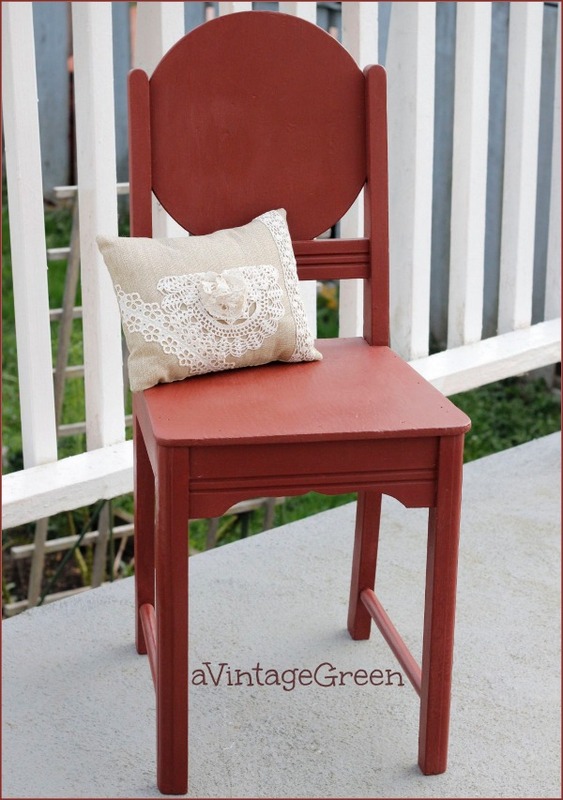 Beautiful red chairs Joy - you've done a great job. We've just got the AS paint here so I'm lining up a project or two as well. I love your two cushions as well especially the one on the left of your first photo - did you make all those yo yos?! a wonderful transformation! Have a great week. I am joining you through Mosaic Monday. Love the chairs Joy. You did a great job with that red paint. I have trouble getting a good red ... maybe need to try ASCP. The little pillow is so nice with the chair. Cute, cute chairs. Love the color you've used too! You are very handy. Nice job!